This week I have worked on some quilts which could not be more different! 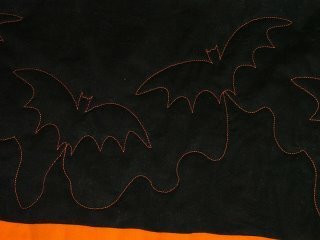 This one was a Halloween inspired quilt. 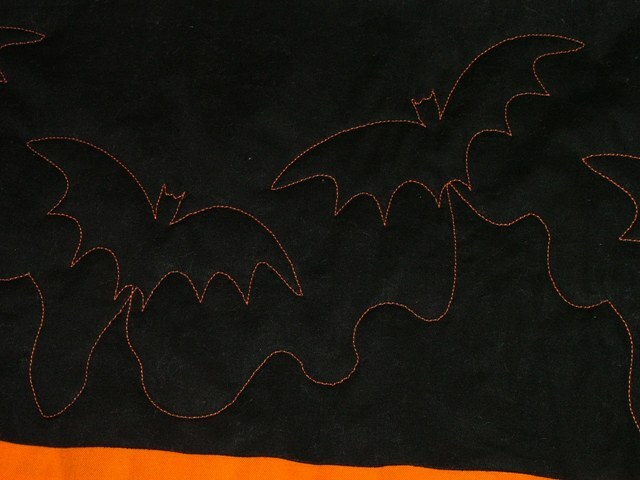 I have quilted orange bats on a black background…very dramatic. The second one was a cream rosebud surrounded by McTavishing…very delicate! I will never be bored with this variety of quilts! This year has marked a dramatic change in my life. 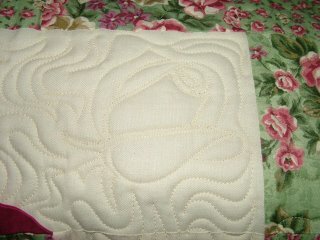 I have gone from a full-time job surrounded by other intelligent women, to starting my own home based quilting business. At times the silence has been deafening. 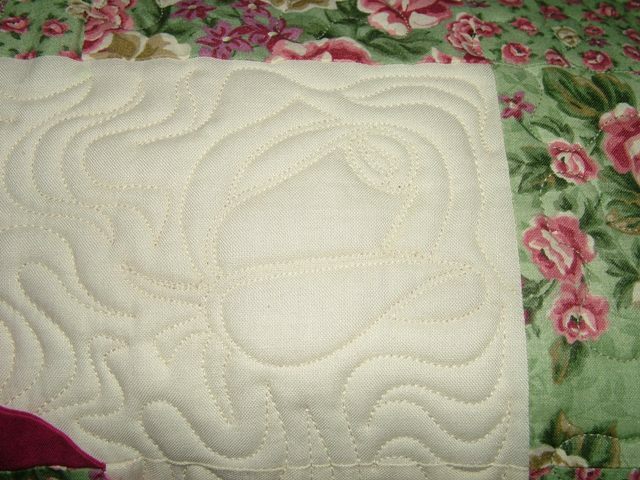 I enjoy the quilting that I am doing. I love to be immersed in creativity and textiles and I am creating a viable business around myself. I have recently been exploring the blogs of other creative, intelligent women and have decided to write my own blog as a means to converse with these people. To that end, I have decided to set myself a regular quilting challenge. My quilt responses need only be at an A3 size, that is 30cm by 42cm or 12 inches by 16 inches. This size is able to be achieved in a relatively short amount of time, but it is big enough to let me explore techniques and materials. If any one should happen upon my blog and like to participate in my quilt challenges I would love to see your finished pieces (or UFO). OK… First challenge. There have been quite a few dinosaur shows on TV in the last few weeks which have been catching the attention of the younger members of my family. So my first challenge is to represent a fossil. Thinking already and off to sew! This is my first post. A bit of an experiment to see what happens. If this works there will be more!